Could Britain ever promote democracy in the Gulf? Only if it turns its own foreign policy away from neoliberalism and militarism, David Wearing argues in a new book. 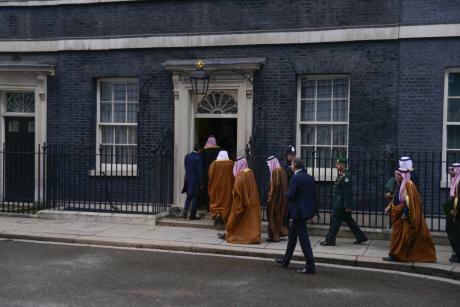 Image: Saudi Crown Prince Mohammed bin Salman entering Downing Street in March 2018. Credit: NurPhoto/SIPA USA/PA Images, all rights reserved. The move to neoliberalism, and the consequent growth of the City of London alongside the decline of manufacturing export industry, has left Britain with a large and growing current account deficit. Running such a deficit puts downward pressure on your currency, which can be offset in two ways: first, by finding areas of the world where you can run a trade surplus, thus narrowing the overall deficit, and second, by attracting foreign inward investment, by which demand for assets in your own currency “finances” the deficit, and keeps your currency stable. While neoliberalism in the UK was becoming more entrenched, the Gulf states were enjoying a huge windfall from oil prices, starting in the early 2000s and continuing until very recently. Gulf demand for imports of goods and services rocketed, as did the sovereign wealth they had available for investment. So British neoliberal capitalism and Gulf rentier capitalism came to complement each other. The UK provided the goods and services and the investment outlet that the Gulf monarchies required, while the Gulf monarchies provided an export market with which it was possible to build a trade surplus, as well as a source of capital inflows that could help finance the current account deficit. DW: These relationships are contingent, not inescapable. The Labour leadership’s aim of demilitarising UK foreign policy and transitioning away from neoliberalism fit well with – and would be decisive in making possible – a major rethink of UK relations with the Gulf Arab monarchs. The fact that it is achievable, however, does not mean that it wouldn’t be a challenge. AngloArabia: Why Gulf Wealth Matters to Britain exploring the UK’s relationship with the authoritarian Gulf states is published by Polity.